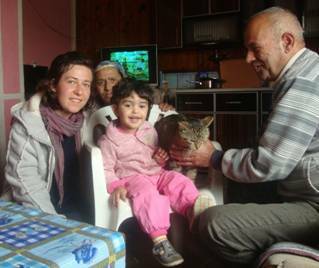 In the frame of „Create a climate for peace: Regional Reaction“ gathering we spend 3 days with a host family in Plemetina. Why Plemetina? For those who don’t know Plemetina is a village in the municipality of Obiliq Commune and it is very near with Kosovo B Power Plant. So after gaining insight about the climate issue/justice topic from presentations and guest experts we went there to see on the ground the real implications that such a power plant can have on people and nature. Only that this place is not just about the multifaceted impacts of the power plant on the surrounding but also about ethno-cultural and religious diversity.Those three days we stayed there are the essence of this gathering. So let us walk you through our Plemetina journey. Well, all the participants were hosted by local people in two. 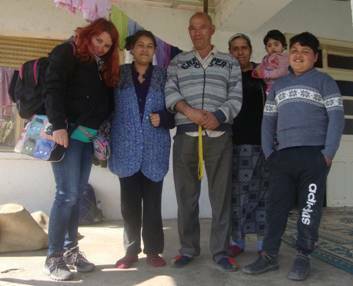 We, Sonja from Serbia and Silva from Albania stayed at the „Pink House“ as it is called, and were warmly welcomed by Meda and Refka, their son Said, their daughter Ersana and her little girl called Feliza andMeda’s brother Xhemal. Oh, yeah not to forget that part of the family was also Pashteto; a chubby, friendly and lazy cat. Almost all the members of our host family were born in Plemetina and have spent most of their lives in this place. It was interesting to spend time with them, and in a way witness their everyday lives near a power plant, but also the generational differences. For example, Refke and Meda got married together because their mother’s were friends and decided that they should be together. Whereas, their daughter Ersana got to know her husband from facebook and after some time they eventually got married at an age of 26. This year Ersana will be 29 year old and her daughter Feliza will be 2 years old. Ersana seems to be a happy mother. Yet, after some stocktaking she now regrets that she dropped out of secondary school. Now she hopes to find an opportunity to attend a vocational course, gain new or improve her skills and hopefully find a job so that she can earn her own money. She actually lives in Bor, a city located in the central part of Eastern Serbia, which is identified as a region rich in copper ore and other metals ore. Being such an industrial city the air and soil there is also polluted. She has moved from one polluted place to another one. Her father has had a heart attack, like so many other in Plemetina, and all this they attribute to the pollution caused by the power plant. As for her, she has had to be hospitalized for some time when she moved to Bor because she had a respiratory problem. She tries her best to build a protective balloon about Feliza by keeping her most of the time in the house or put her a face mask every time they go outdoors.Still, she knows that this is not a wayout. She hopes that she can move abroad with her family, in a country such as Spain, or she would like to move to Belgrade. For her it is important that Feliza, gets the opportunity to finish school, pursue university studies and get a job so that she can be economically independent. She hopes her daughter will have a better life than her. Our host family’s story makes us aware that nature and pollution knows no borders. Unfortunately, there is no protective balloon against climate change and pretending to have a blindfold so as to avoid dealing with climate justice and environmental pollution is also not a solution anymore. In those three days we understood the hardships of „living together“ in such a diverse setting and in reconciliation with the power plant, but also realized the danger of being trapped by stereotypes and prejudices on roma people. After living with them, we just cannot be that superficial! This is an experience to be grateful for because we shared together our thoughts and feelings not only on climate change, environmental issues, ethnocultural particularities but we also got a warm feeling staying there and the joy that you can get only when you live in big families and in communities where people still know each others names. We leave with Feliza’s smile in her face and the warmhearted people we met in Plemetina and go towards our homes with full of motivation and energy to do our best for a better future.